The new story distanced itself in certain aspects from the novel, which Dante had been dissatisfied with. In adapting the story, Dante also rejected the Studio’s proposals “to use large wolves” to portray the antagonist creatures — an approach Dante “always found disappointing” in other films of the genre. “It’s very hard to even find actors who can look natural while filming a scene with an animal,” Dante explained, “and it takes tremendous time and patience waiting for the animal to do the right thing. 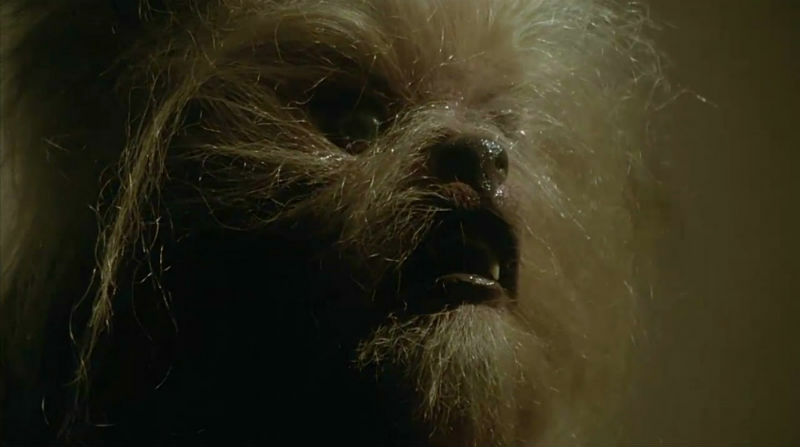 And that’s just for normal rabid wolves footage — nothing supernatural at all. 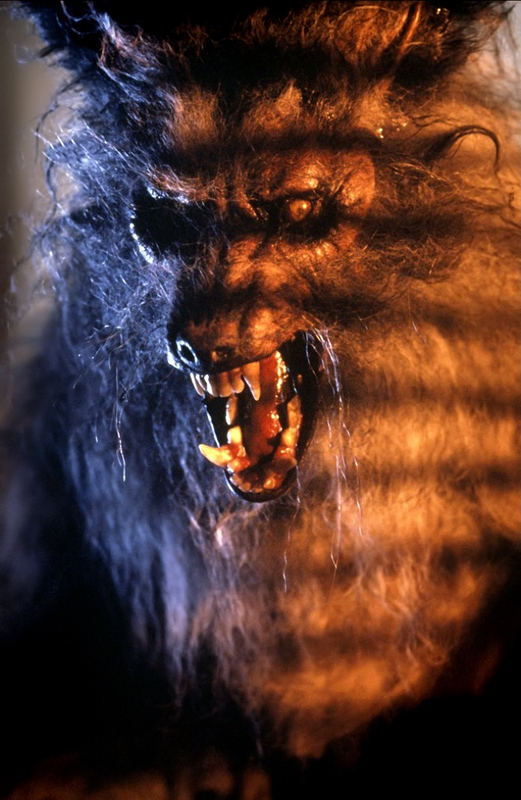 Real wolves aren’t scary; it brings things down to nature, really robs things of any fantasy value.” The director was, in fact, adamant in the intention to portray Werewolves as beastly humanoid creatures in his film — nightmare stalkers. 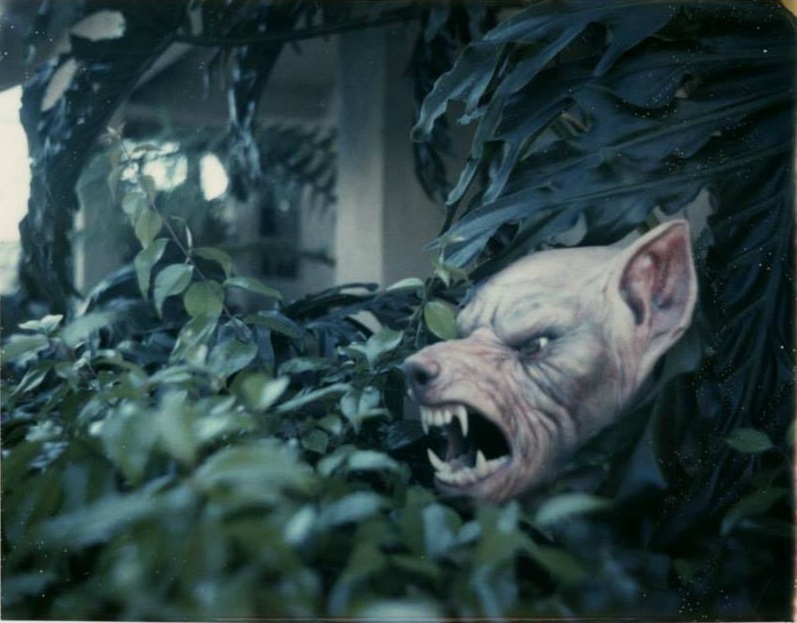 A transformation test had to be devised to convince Avco films executives to provide a proper budget for the creature effects. 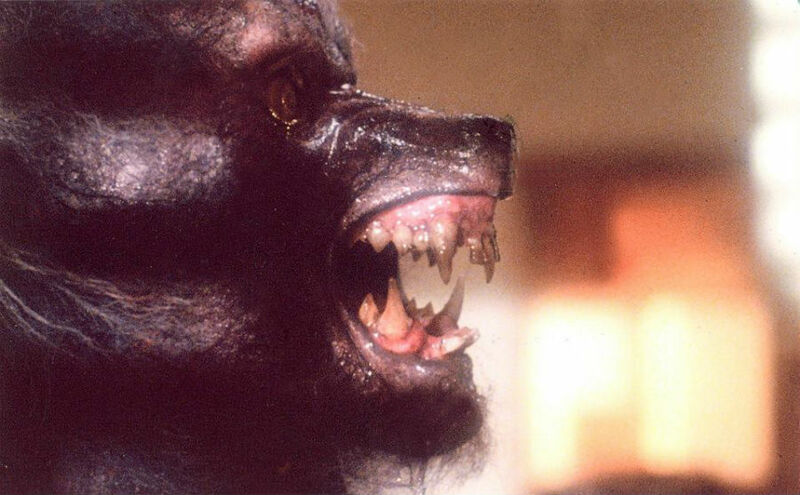 Beforehand, Werewolf transformations had been achieved with lap dissolves connecting different stages of the transformation, represented by progressive make-up appliances. With the intention to avoid a similar, unrealistic effect, Bottin considered a number of possibilities. “We were stumped for a long time,” Bottin told Cinefantastique. “I talked to Randy Cook, Jon Berg and Phil Tippett about the possibility of using replacement animation, but that didn’t go anywhere. At that point, Rick and I were just going to do the transformations in cuts.” Miniature effects were also considered but quickly discarded. 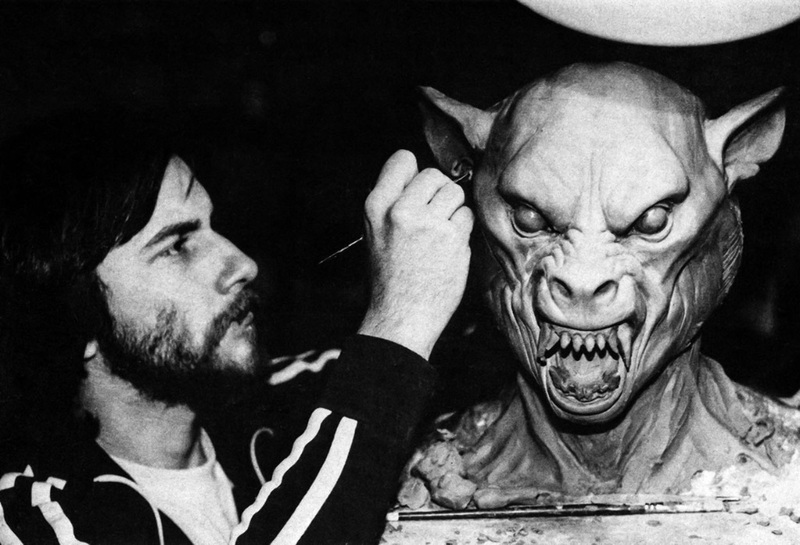 Baker sculpts a design for a Werewolf — a very similar configuration to one of the transformation stages that would later appear in American Werewolf in London. “The list of effects they wanted was amazing,” Bottin told Cinefantastique, “they wanted the most incredible transformations ever filmed. And they kept asking me, ‘are you sure you can really do all this stuff? '” The extensive body of work demanded a large crew; Bottin assembled at least 25 people for the project, including make-up artist Greg Cannom — who applied the entirety of make-ups for the film — and sculptor Dale Kuipers. For the first stage of transformation, several air bladders were placed on Robert Picardo’s forehead, cheeks, neck, chest, shoulders, and arms, and concealed with make-up appliances. In addition, he also wore contact lenses and prosthetic teeth. The effect of Eddie’s nails growing into claws was achieved with a hollow insert hand with cable-controlled nails that could slowly spring out. The technique, inspired by stiletto blades, became known as the ‘stiletto nail’ effect. Once the features on Eddie’s face begin to change more radically, the actor is replaced by a series of animatronics — labeled by Rick Baker as ‘Change-o-Heads’. The Change-o-Heads were sculpted by Bottin, and much like the test transformation head, were built with techniques first experimented on Tanya’s Island and refined for The Howling. 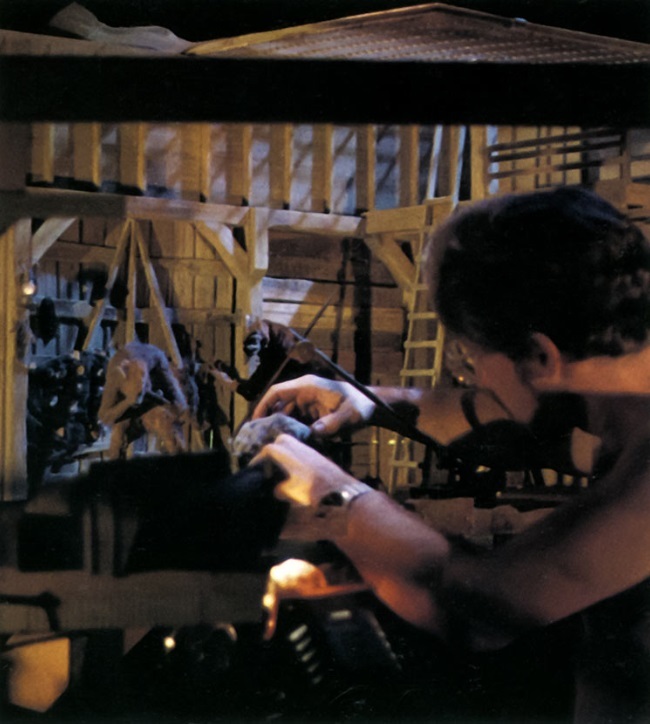 The animatronics and their mechanical designs were devised by Bottin and Doug Beswick. Complex gear and lever assemblies shifted parts of the skull, altering its appearance in predetermined areas, such as by elongating the jaw. A total of three ‘Change-o-Heads’ was devised to represent the progressive stages of transformation, each capable of up to 15 different actions. The effect was also aided by editing — where each stage is shown in shots where the heads already are in motion. The transformation scene needed several takes. In one take, Picardo risked suffocation when the bladder on his neck overinflated –and generally, the bladder effects often failed to function — overinflating and exploding more than once. Certain sequences of the transformation were filmed at a higher or lower frame rate, in order to increase dramatic effect. Other minor transformation effects in the film, used in partial metamorphosis sequences, utilized similar techniques: make-up appliances, contact lenses, prosthetic teeth, and mechanical masks. 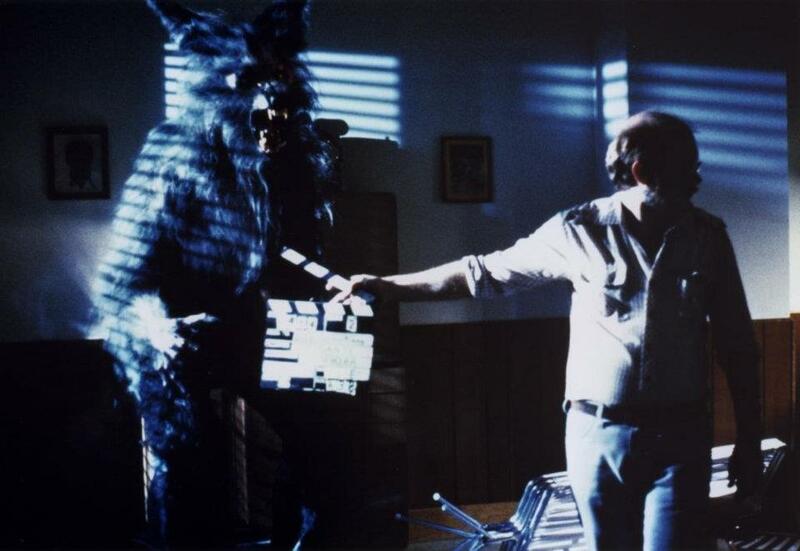 A puppet transforming hand and forearm was also devised for a scene where a severed Werewolf limb is seen. 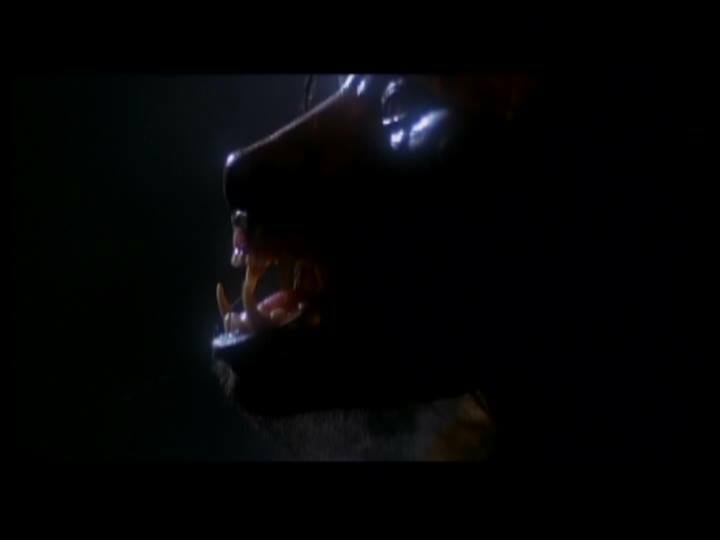 One particularly complex effect involves teeth growing into Werewolf fangs; to achieve this, Bottin built a prosthetic device hidden within the actor’s mouth. A compact lever device — concealed by a palette piece, with the tongue control in turn covered by the actor’s snarl — controlled a bar that elongated the teeth accordingly. The very structure of the prosthetic meant that it could only be shot at certain angles to achieve the desired effect. 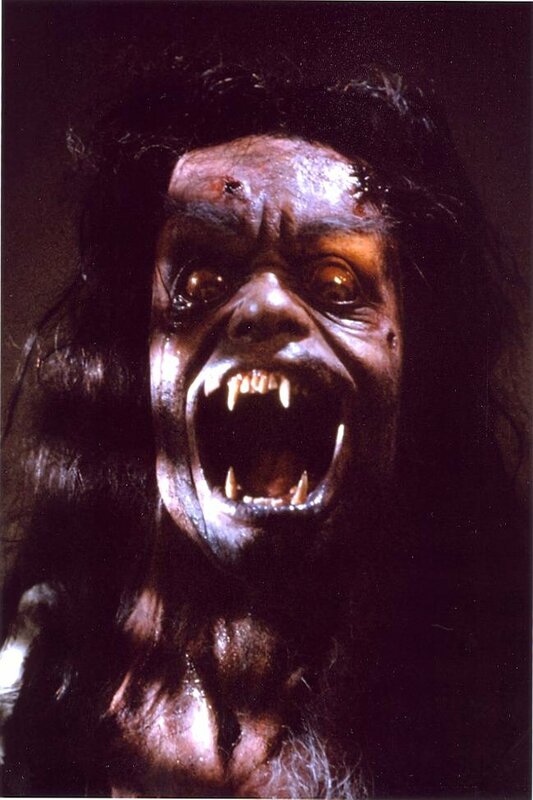 The Karen Werewolf during transformation. 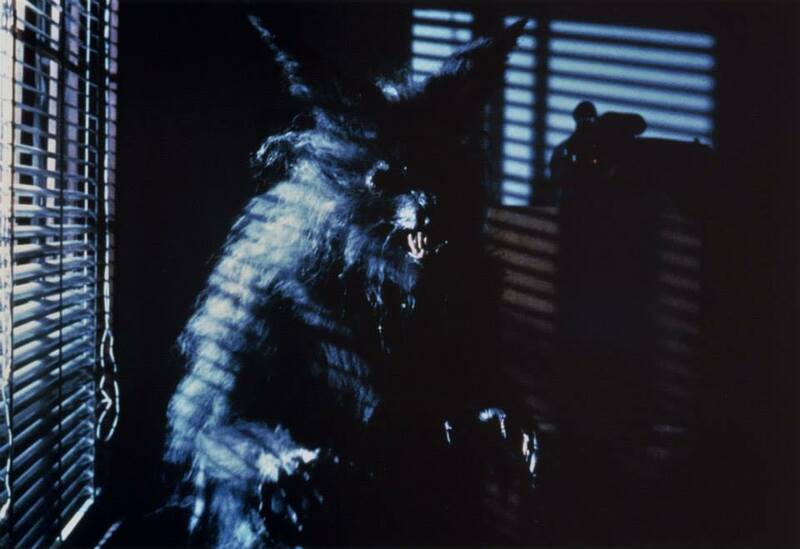 At the end of the film, Karen White attempts to reveal the existence of the Werewolf society by transforming during filming of her news program. 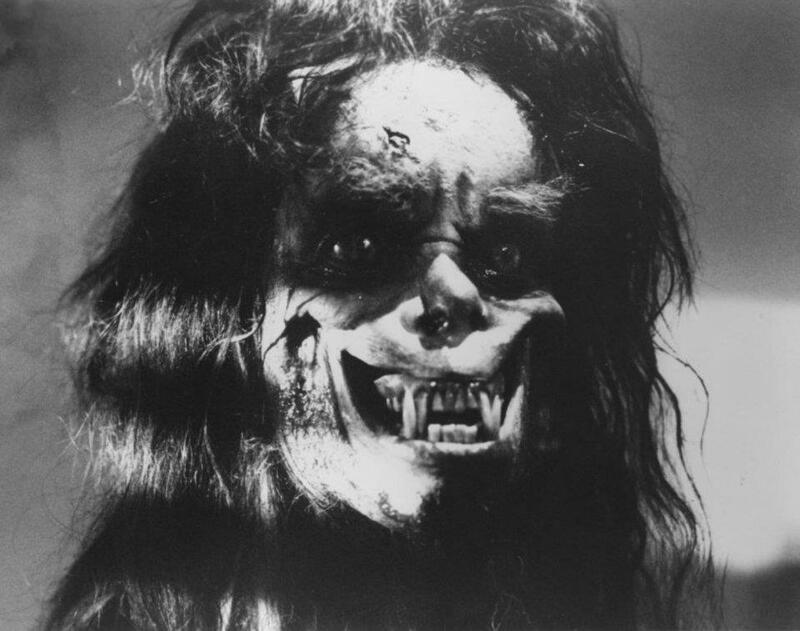 The single mid-transformation animatronic head devised for the sequence, a late addition to the film, was designed to reflect the fact that Karen rejected the Werewolf society, and wanted to resist her newfound instincts. The original insert head. Notice the more humanoid configuration of the incisives, as well as the larger fangs. 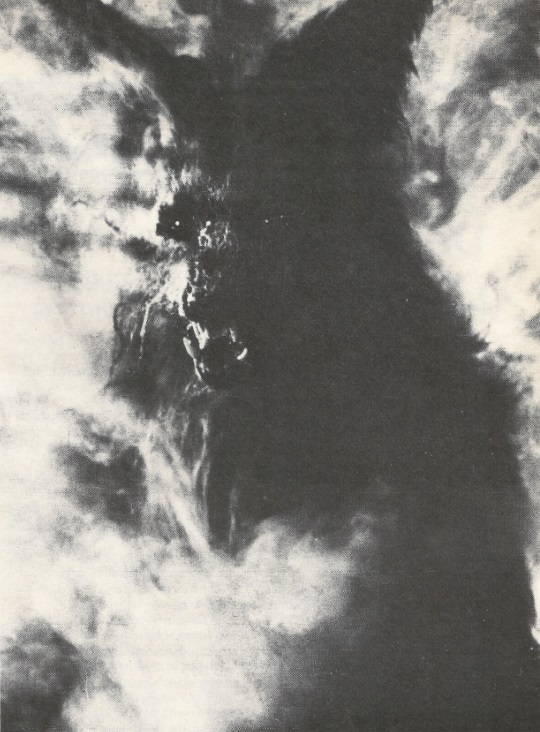 Dante demanded Avco executives to receive additional budget for the creature effects — a request that was ultimately approved. 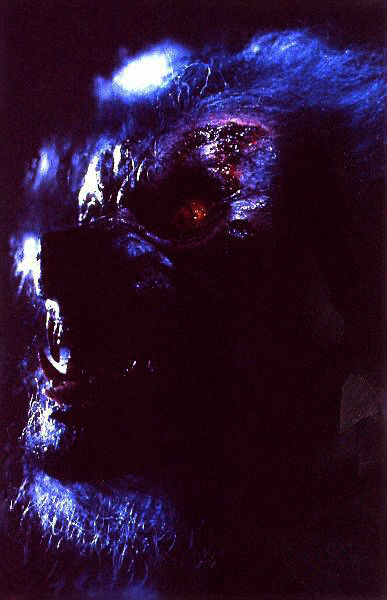 For the new Werewolf effects, Bottin collaborated with Dale Kuipers and his crew in realizing a new Werewolf suit and a hero animatronic head. 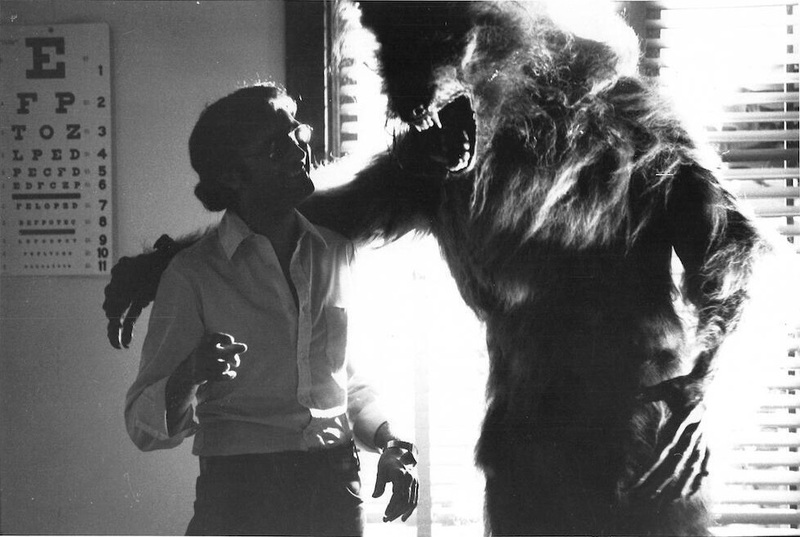 Taking advantage of the extensive reshoots of the creature effects sequences, Bottin cosmetically revised the Werewolf design, making slight modifications to the configuration of the head. The structure of the snout was changed; the eyes were coloured with different hues; the teeth were altered, with shorter fangs, and a more wolf-like configuration of the incisives; the ears were elongated; and the fur on the snout and face was placed differently. The suit’s head was only capable of basic mouth opening movements, whereas the animatronic head had a wider range of articulation — with brow and lip movement. 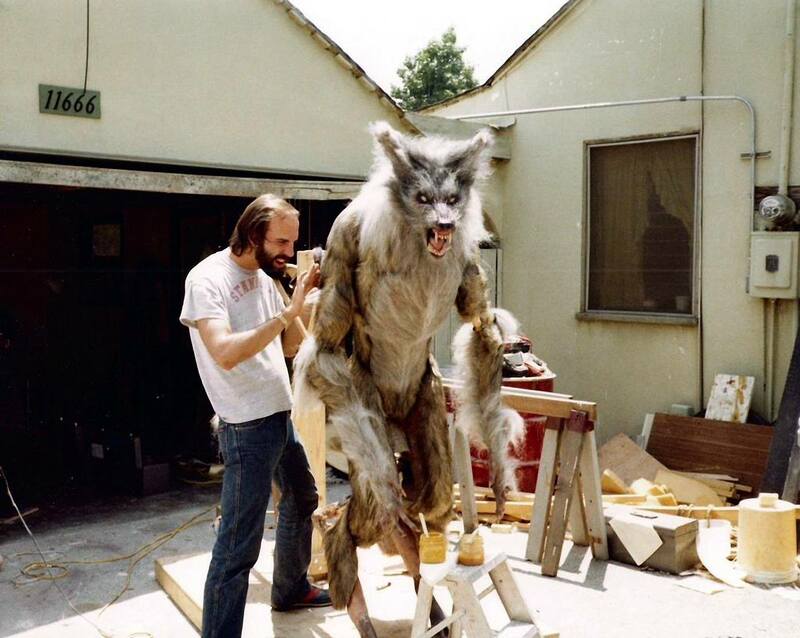 To convincingly portray the Werewolf’s digitigrade legs, Erik Jensen built insert mechanical legs, used coordinately with the suit in cuts. 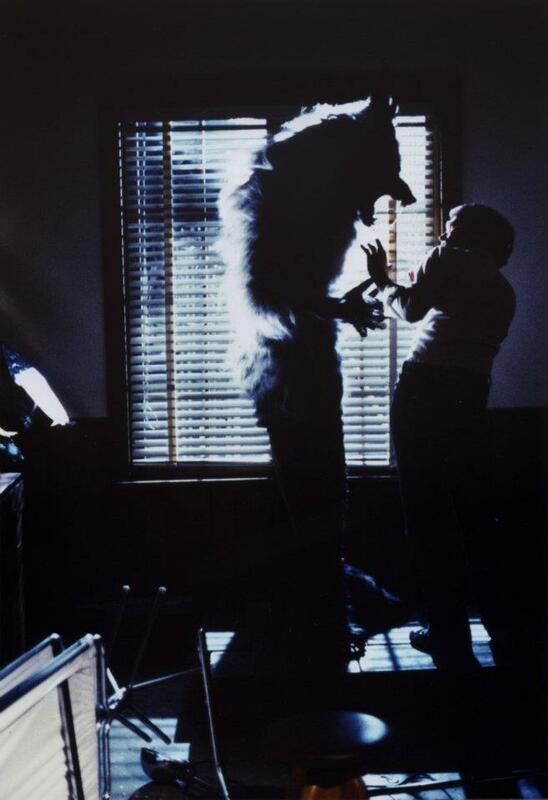 With the appropriate editing techniques, the nine-foot-tall Werewolf was convincingly suggested in the final film. Joe Dante poses with two of the Rocket Werewolves. 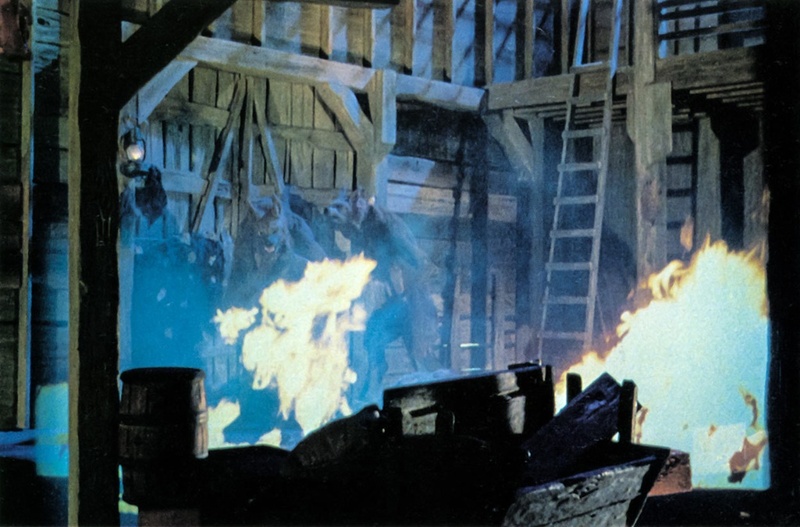 A deleted effect from the film involved full-size Werewolves being shot out of the barn during the climax. 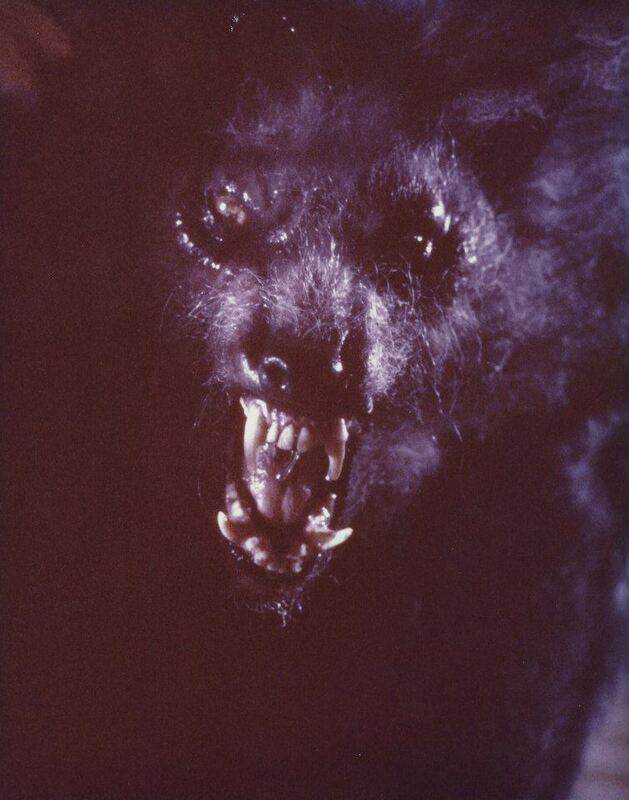 The so-called ‘rocket Werewolves’ were cut from the film because the results of the effect were deemed comical. Jeff Shank works on the rod puppet. 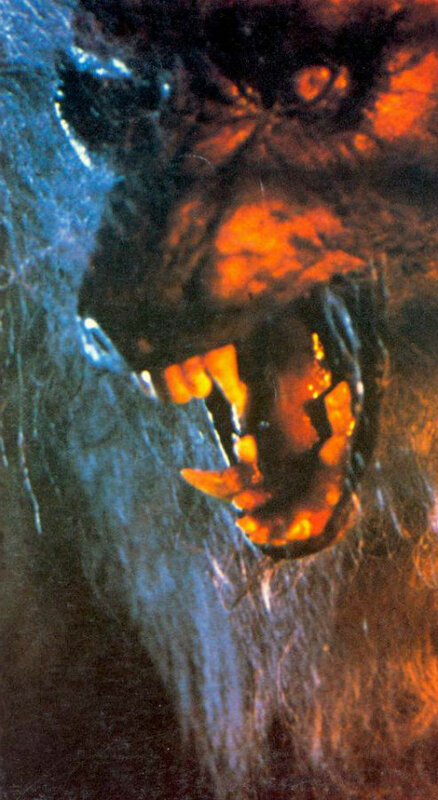 The creation was ultimately left unused — but served as a base for the stop-motion Werewolves. 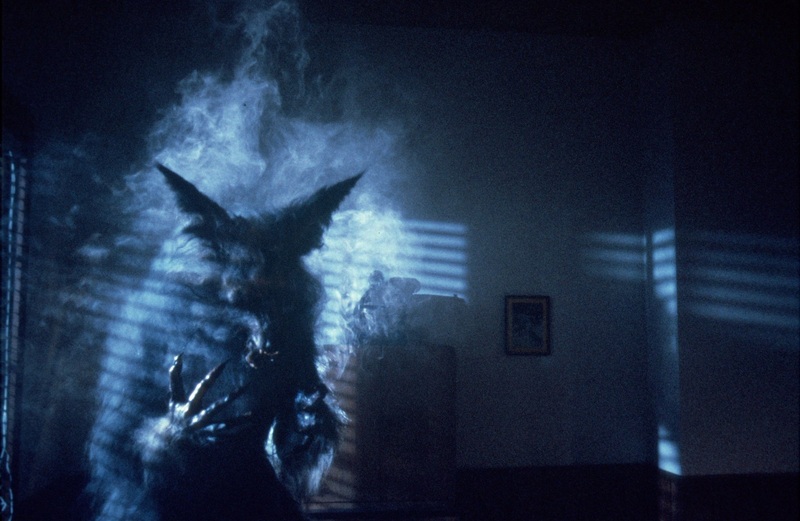 However, after test screenings, it became apparent to Dante that the stop-motion Werewolves did not fit with the rest of the live-action footage, not only for the ‘staccato’ effect typical of the technique, but also because the Werewolves themselves looked different to the final Werewolf design used in the reshoots. “At various screenings, after the picture,” Dante recalled, “people were coming up to me and asking what picture the neat stop-motion footage came from. 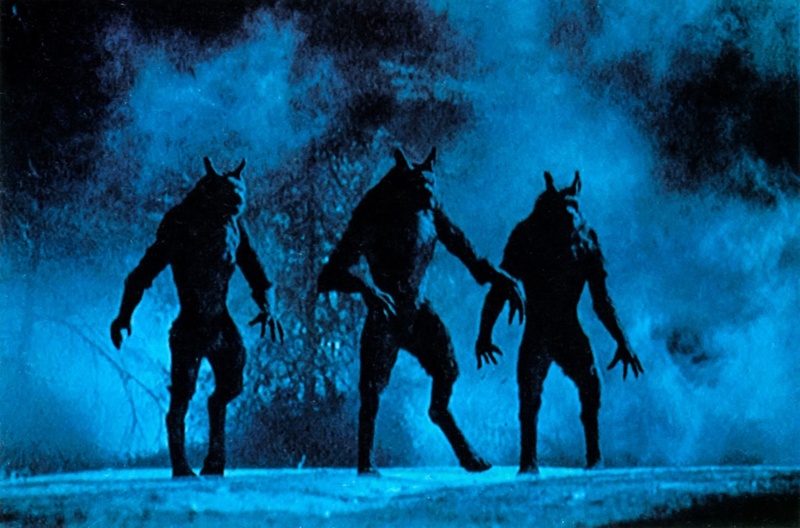 There was nothing wrong with those shots; it was just that the Werewolves moved differently — like in a Ray Harryhausen film where they cut from a stop-motion creature to a full-size live-action shot. 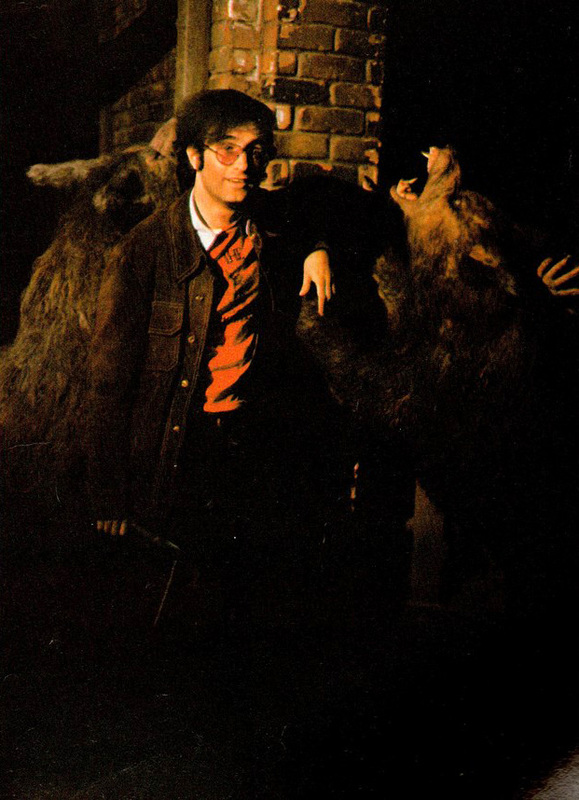 Also, the colours of the Werewolves were slightly different from the full-size wolf, which we didn’t have at the time Dave Allen started up.” Only a single stop-motion shot survives the final cut — showing three Werewolves during Karen’s escape. 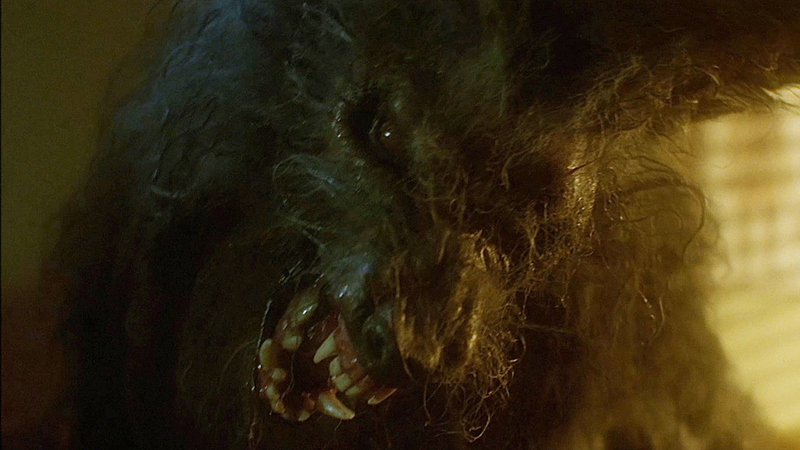 For more images of the Werewolves, visit the Monster Gallery. 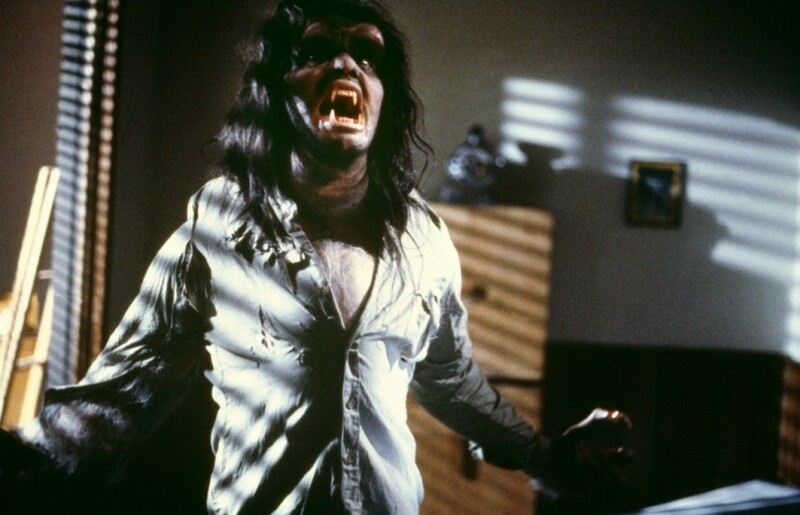 Posted on 13/03/2016, in Movie Monsters and tagged Rob Bottin, The Howling, Werewolf. Bookmark the permalink. 4 Comments. LOVE everything about this! Joe Dante is one of my favorite director/producers namely for his cartoon-esq characters sometimes in his films like the episode “It’s a good life” of Twilight Zone: The Movie which I absolutely love. Neat note about Karen’s cutesy transformation being a deliberate in-character effort to restrain the Beast. Thanks for sharing such in-depth material.